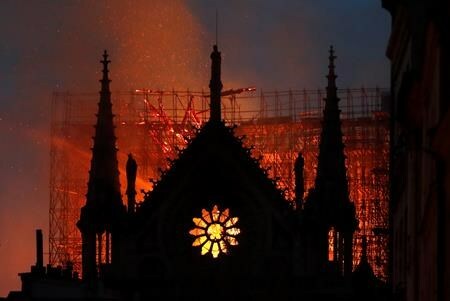 TORONTO — The Archbishop of Toronto says the destruction today of the Notre Dame Cathedral in Paris is both tragic and sad. Thomas Cardinal Collins says the centuries-old church represents the presence of God and the spirit of the human heart. He says a cathedral is meant to be a sign of beauty that leads to truth and goodness. Collins also says the destruction has affected everyone in the world because of its history and magnificence. The archbishop points out that this is the holiest time of the year for Christians. As a result, he calls Monday’s tragedy most poignant. The archbishop said the Notre Dame is an “astonishingly important” place. TORONTO — Ceremonies and vigils are planned today to honour those killed or injured in last year’s deadly van attack in north Toronto. The City of Toronto is holding an event at the Mel Lastman Square Amphitheatre at 1:30 p.m. to coincide with the time of the April 23, 2018 incident that left 10 dead and 16 injured. In the hours before the ceremony, the city is expected to install temporary signs in the area to commemorate what it has dubbed the “Yonge Street Tragedy” until permanent memorials are created. The city says consultations on the memorials will begin this spring. Events are also planned elsewhere in the neighbourhood where the attack took place. The Willowdale community is hosting a moment of silence, an evening vigil and a free dinner, among other events. It is also bringing in trauma counsellors and therapy dogs for those who need support. The city was gripped with grief in the wake of the attack and more than $4 million was raised in support of the victims and their families. Alek Minassian, 26, is charged with 10 counts of first-degree murder and 16 counts of attempted murder. He is set to face trial next February. TORONTO — The Royal Canadian Mint is unveiling a new commemorative loonie today meant to mark what it calls a key milestone for lesbian, gay, transgender, queer and two-spirited people in the country. But historians and advocates are raising concerns about the message behind the new loonie, saying it mistakenly suggests equality has been achieved and largely as a result of the federal government’s actions. A group of activists and academics is holding a news conference near the mint’s event today to challenge myths surrounding the 1969 Criminal Code reform. York University historian Tom Hooper, who is part of the group, says LGTBTQ people faced continued criminalization over the decades that followed the legal changes. He said discrimination against LGBTQ people persists today, noting as examples that trans and queer people of colour still face issues with policing and people with HIV remain subject to criminalization. The mint “could have consulted people who have knowledge of this history but they didn’t,” Hooper said, adding he hopes the agency will do so in the future. He acknowledged no campaign can compete with roughly three million coins but said the project is at least fuelling a public conversation about LGBTQ history. “As a historian, I’m hoping to inform as many people as I can about our history. So in some ways the coin is opening up that opportunity,” he said. The mint has said it is largely informed by the Department of Canadian Heritage and its “anniversaries of significance” when it comes to selecting commemorative themes for coins.